George Clooney and Amal just made the United Nations gala in New York one helluva lot sexier, and George’s dashing date is definitely making his parents proud. We don’t see George and Amal out too often, and she’s looking totally stunning in this blue and white dress. If you ask us, she could probably bring about world peace with one hair flip. 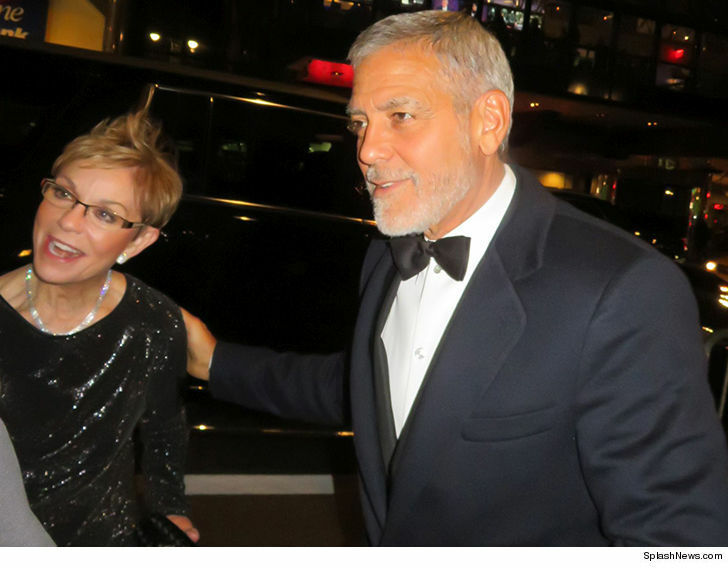 George is looking handsome as hell too … and his mother, Nina Bruce Warren, looks like she’s having a grand ole time. But, how could you not? Nina’s rolling up with her dapper movie star son and his smoking hot wife. And, don’t forget about Nick Clooney, the cute old man in the tux helping Amal make her grand entrance. Way to go, mom and dad, we can totally see where George gets his good looks. The Clooneys dressed to the nines for Wednesday’s U.N. Correspondents Association Awards at Cipriani. Amal is a civil rights lawyer, activist and humanitarian, but if there’s an award for best dressed tonight, she’s a lock.